03 - 12 ACURA TL MDX RL / HONDA ACCORD PILOT / SATURN VUE. 3.0L & 3.2L & 3.5L 3.7L VTEC SOHC V6 24V. Brand New Engine Timing Belt Water Pump Kit. 2003 - 2007 HONDA ACCORD 3.0L VTEC SOHC V6 24V, ENG. 2004 - 2008 ACURA TL 3.2L VTEC V6 24V, ENG. 2003 - 2006 ACURA MDX 3.5L VTEC SOHC V6 24V, ENG. 2005 - 2008 ACURA RL 3.5L VTEC SOHC V6 24V, ENG. 2008 - 2008 ACURA TL TYPE-S 3.5L VTEC SOHC V6 24V, ENG. 2009 - 2012 ACURA TL 3.5L VTEC SOHC V6 24V, ENG. 2010 - 2011 ACURA TSX 3.5L VTEC SOHC V6 24V, ENG. 2008 - 2012 HONDA ACCORD 3.5L VTEC SOHC V6 24V, ENG. 2010 - 2011 HONDA ACCORD CROSSTOUR 3.5L VTEC SOHC V6 24V, ENG. 2005 - 2011 HONDA ODYSSEY 3.5L VTEC SOHC V6 24V, ENG. 2005 - 2008 HONDA PILOT 3.5L VTEC SOHC V6 24V, ENG. 2009 - 2011 HONDA PILOT 3.5L VTEC SOHC V6 24V, ENG. 2006 - 2008 HONDA RIDGELINE 3.5L VTEC SOHC V6 24V, ENG. 2009 - 2011 HONDA RIDGELINE 3.5L VTEC SOHC V6 24V, ENG. 2006 - 2007 SATURN VUE 3.5L VTEC SOHC V6 24V, VIN CODE "4". 2007 - 2011 ACURA MDX 3.7L VTEC SOHC V6 24V, ENG. 2009 - 2011 ACURA RL 3.7L VTEC SOHC V6 24V, ENG. 2009 - 2012 ACURA TL 3.7L VTEC SOHC V6 24V, ENG. 2010 - 2011 ACURA ZDX 3.7L VTEC SOHC V6 24V, ENG. 1 Timing Belt (197 teeth). 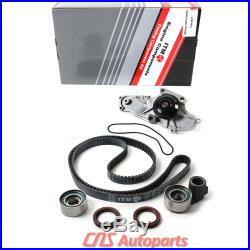 The item "Timing Belt Water Pump Kit 03-12 Acura Honda Saturn 3.0L 3.2L 3.5L 3.7L SOHC V6" is in sale since Wednesday, March 20, 2013. This item is in the category "eBay Motors\Parts & Accessories\Car & Truck Parts\Engines & Components\Timing Components". The seller is "cnsautoparts" and is located in South El Monte, California.